Tweezers are something that every beauty bag and medicine cabinet should contain. Of course, until you’re in desperate need of them, they’re not something you are likely to give a second thought to. The thing is, most of the time tweezers aren’t an essential tool to have. However, when you spot a stray brow hair and need to pluck it, having the right pair of tweezers is crucial. 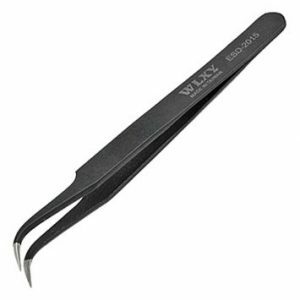 A lot of people pick up the first pair of tweezers they see, buy them, and that’s that. But tweezers don’t come in a one-size-fits-all design. There are various types of tweezers to choose from. Each of which is best at using for a certain task, such as plucking your eyebrows. That’s why when buying tweezers, you need to take the time to find the perfect pair for the task in hand. There are six main types of tweezers; slant tip, pointed tip, pointed slant, square tip, round tip, and curved tweezers. Each different tweezer type comes with different uses. That’s why it’s so important to get it right when it comes to buying a pair. Slanted tip tweezers are the most popular type of tweezer, the ones that most people have in their beauty bags. The blade of these tweezers is cut at an angle, creating a slanted tip, as the name suggests. 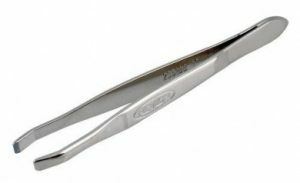 These are known as being a great tweezer for anything and everything – they’re the tweezer all-rounder. Because of how easy to use and versatile they are, they’re often recommended as a good starting point for new tweezer users. Slanted tip tweezers allow for precise plucking. You can use the longer tip or the shorter one, depending on how much precision you want. The flat end of the tweezers will allow you to grab larger amounts of hair at one time, for instance. They can even be used to apply false eyelashes effectively. As the name suggests, these tweezers have a long, sharp point, offering the highest level of precision. These might look a little scary – a bit like a medieval torture device, but they can be useful. The narrow point of the tweezers makes it easier to see the area that you’re working on. This makes them more effective to use, as long as you have a steady hand, that is. Because of how sharp they are, pointed tip tweezers aren’t recommended for beginners. Or for doing your eyebrows, unless you opt for a slightly rounded version, that is. They are, however, amazing at removing splinters, even those pesky flat ones that sit smoothly under the skin. As well as for getting rid of nasty ingrown hairs. In terms of beauty, pointed tip tweezers are a must-have for nail art, as they’re perfect for placing nail art, such as decals and gemstones. 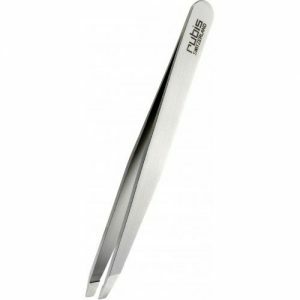 A clever combination of slant tip and pointed tip tweezers, pointed slant tweezers are a fantastic middle ground option. With a steeper slant than regular slant tipped tweezers, these are amazing for plucking. However, they can be hard to get hold of as they’re not the most popular design. Fantastic for removing stubborn hairs, splinters, and ingrown hairs. Square tip tweezers, also known as flat or straight tip tweezers, have a straight, flat edge, and no point. 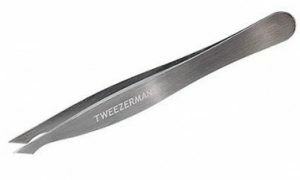 Because of this, they’re not the most precise type of tweezer. However, for removing patches of hair in one go, they can work well. But that’s about all they can do, making them a rarely used type of tweezer. There’s no doubt about it, for anyone who’s safety conscious, round tip tweezers are the dream. Because these tweezers have a rounded edge, there’s no way you can stab yourself, unlike some of the sharper designs. 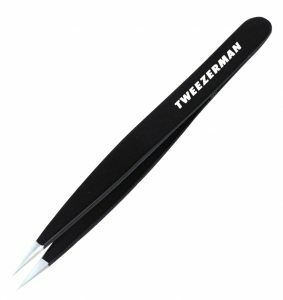 The great thing about these tweezers is that the rounded tip allows you to hold them however you like, without affecting how effective they are. That being said, when it comes to accuracy, they’re not that great. For holding things, like a cotton swab for dabbing the skin with, they are fantastic. But in terms of plucking hairs or removing splinters, they’re far from ideal. 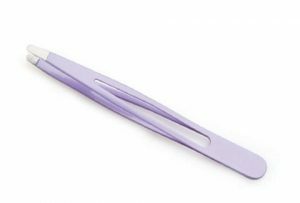 These tweezers aren’t made to keep your eyebrows in shape or to remove those pesky chin hairs; they’re made for placing objects down. For nail art, they’re fantastic. There is no tweezer that’s more accurate when it comes to placing rhinestones and decals than curved tweezers. They’re also amazing for using to apply false eyelashes, as they give a fantastic level of control. 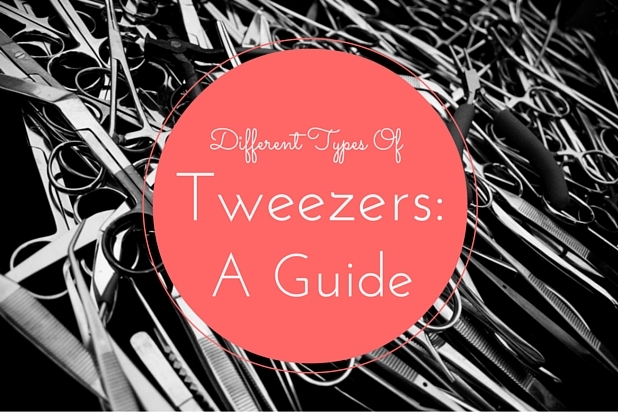 How many different types of tweezers are there? This guide hand tested 80 different types of tweezers for performance – check it out! Can you bring tweezers on international flights as hand-luggage? Why yes you can, according Gov.uk. Should you ever share your tweezers? According to this article – no you should not – or make sure to sterilise them first. Main image adapted from a photo by Michael @ Flickr.